The Elvish name of the river called the Gladden by Men, meaning 'River Goldwater'. Sîr is simply the Elvish word for 'river', so in full the name Sîr Ninglor translates as something like the 'River Goldwater'. In principle it might be used as a prefix for any river name, though in practice it is rarely seen. 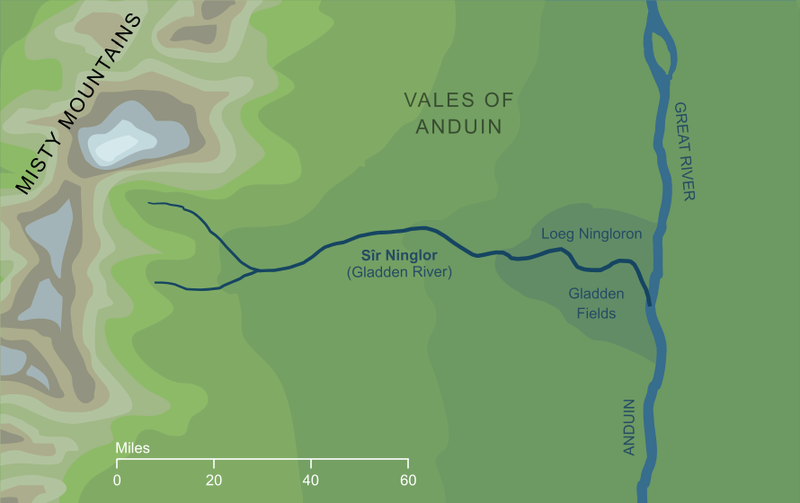 The only other prominent example is Sîr Angren ('river of iron'), the full Elvish name for the river Isen on the borders of Rohan. Original content © copyright Mark Fisher 2000-2001, 2018. All rights reserved. For conditions of reuse, see the Site FAQ.